Keep it clean !! A short article on how the clean line principle has evolved. I remember attending my first ever rescue class in the uk in 1996 as a fresh faced 19 year old kayaker. I had attended the course as I wanted to learn more about rescue & river safety. During this time in the UK & Europe there was this new trend called the"Clean line principle" starting to gather momentum. Stories were coming to light that the handles in the end of your throwbag were potentially dangerous and could cause a snag hazard resulting in potential fatal accidents. The clean line principle advises us that a loop in either end of a throwbag is a potential snag hazard. This means that the loop could potentially become snagged in a tree root or around a rock thus creating a potential entrapment hazard We have always been taught that "Rope & Moving water are a bad mixture". A swimmer or an object could then become entrapped in the snagged rope escalating a bad situation. By removing any loops from your throwbag you were reducing the probability of creating a snag hazard. Any throwbag with a loop big enough to get a hand through is an entrapment hazard. In my eyes over the years the clean line principle has now evolved into the "Clean Principle". We have taken our leanings from the clean line principle and applied them to our personal Personal Protective equipment (PPE) set up. Unfortunately on my travels I am still seeing and hearing lots of stories of entrapment's and near miss situations that could have been avoided in the "clean principle " had been applied. In this post I would like to give some examples of accident and near misses and discuss some common solutions on how to avoid them. This video has been on you tube for a while now. 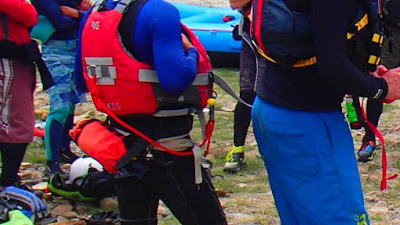 As the guide hits the hole he falls back onto an open gate carabinner that is securing his throwbag into the raft. This then entraps the guide into the raft as it is surfing in the hole. This could have turned very nasty very quick. If you need to attach your throwbag to the raft use a locking carabinner & keep it locked at all times . Notice how the open gate carabinner has forced its way through the pocket of the PFD ! Loose PFD straps or poor designed kit lead to entrapment's The Video below sums this up. The kayaker was entrapped by a loose PFD strap that was not correctly adjusted. I will put my hand up back when I first started guiding I used to wear my Flip line around my waist. 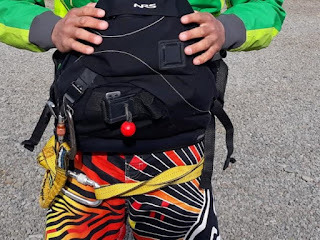 I remember been taught that having your flip line around your waist made it quick and easy to get to instead of having to route around in your pfd pocket during a flip. Unfortunately I then heard about a kayaking fatality from a friend who told me the kayaker had drowned due to becoming entrapped by the flip line wrapped around his waist. A flip line stored around the waist is a massive entrapment. Also in this picture note the 2 unlocked locking carabinners along with a cow tail that is too long. Since then I stored my flip line between my pfd and body neatly rolled up which is easy to get to plus It can double up as a quick 5m throwline should I need it. Another massive misconception I see is the use of the cowstail or affectionately know as a towing tether. the cowtail was first introduced by German paddlers in the 80s. Its intended use was to be able to attach a rescuer A (set of brains onto one end of a rope) or a quick way to attach a line to a entrapped person. Over the years people have adapted the cowtail to be used to tow swamped kayaks. Some manufactures have even gone as far as to market the cowtail as a tow tether and increased its length to accommodate a tow. This has now led to massively excessively long cowtails dangling from pfds which 9 times out of 10 are attached to a solid point that cannot be released causing a massive entrapment hazard. Both paddlers here are wearing cowstails attached to there PFDS. The paddler on the left has a loose over sized cowtail that is an entrapment hazard . Whilst the paddler on the right has a snug tight fitting cowtail. Many Paddlers have now opted out of using a cowtail as most of the market available cowtails are too long. I have simply cut down a piece of webbing an measured my own cowstail to be a snug fit cutting down on the chance of it becoming an entrapment hazard. You are your own unique individual it is up to you to make the judgment decisions and accept the risk of how you set up your personal paddling equipment. Here are my top tips for reducing equipment based entrapment. Always carry a knife that is easy to access with one hand in an emergency. look at your own personal set up look at ways to minimize entrapment hazards. Always ensure your pfd is correctly fitted and adjusted. Take out or reduce any big loops in your throwbags. 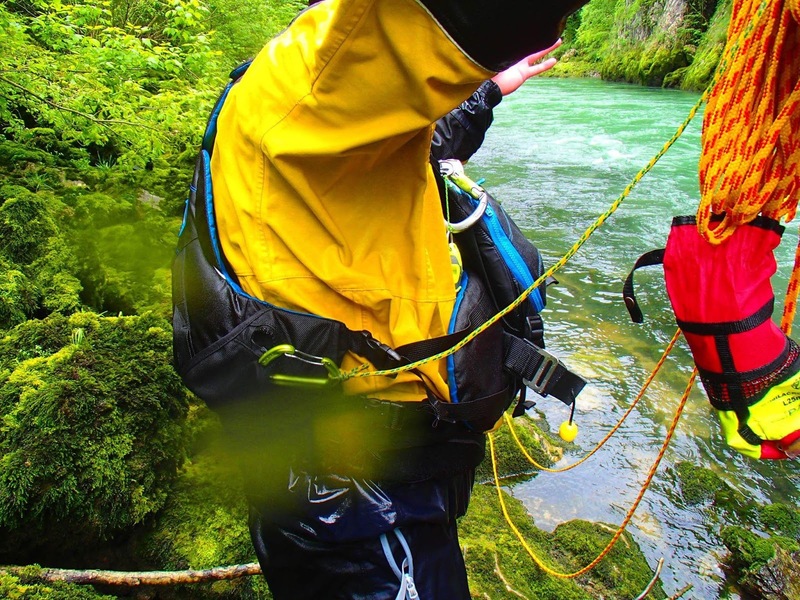 Attend a whitewater rescue course and get tuition from a experience qualified instructor. Share this article with your paddling community so that your days on the river dont turn into near miss stories in the bar. The Georgia project had been on the burner for a while.The sport of Rafting is growing in Georgia. Georgia also recently hosted a European cup event. USaid had kindly sponsored and paid for a group of 13 Self taught Georgian raft guides to attend a 9 day IRF certification workshop combined with a Rescue 3 Europe Whitewater rescue technician course. The Aim of the course was to work with the company owners & senior guides to help them gain IRF certification. Our main aim was to also introduce some safety standards that all of the guides and companies could adopt and start to implement once the workshop was over. We had been planning the course since March. Myself & Gaspar were now in Georgia and ready for action. I had previously run a rescue course in Georgia so I already knew what to expect. Both myself & Gaspar had decided to strip things right back to the basics and run the 3 day WRT rescue course before we even attempted to start to formally assess for IRF guide & trip leader awards. As I say on every workshop that I run it is very rare that a guide presents him or her self for an assessment and has all of the skills needed to pass straight away . The WRT would give us the chance to tune up the guides rescue skills. The workshop was to be based on 3 different rivers providing us with the opportunity to work & observe on a variety of different rafting environments. We settled into our first camp on the banks of the Rioni river and got to work. After a quick personal equipment check we headed to the river to look at swimming and some conditional rescues. During day 1 we looked at the basic principles of river rescue. We also did lots of swimming and practiced throw bagging lots &lots. We studied different types of throws with a variety of different belay techniques. In order to move on through the WRT syllabus we also need to create a team work ethic which was an important factor too. We ended day 1 with 2 land based sessions looking at personal & team equipment we then followed this session with a introductory session on knot tying. A good friend of mine once told me that Georgia was famous for its hospitality & good food he was so correct. out hosts sat us down to a feast with plenty of local wine it was a great way to end day 1.
later on day 3 we started to look at river running skills & tactics. for this we used the CLAP model to increase our river safety. For those who are not familiar here is a quick introduction. As we did not all have a common language on the course we looked at the power of the silent safety demonstration and how the guide & the customers dont need a common language in order to communicate. I gave a demonstration using my own version of the silent safety demonstration before we tackled the class 3 Murkali gorge on the Rioni. Day 4 greeted us with an amazing thunder storm and lots of rain. Myself & Gaspar had a hard time convincing the students that once the storm had stopped that rafting in the rain was perfectly acceptable and practiced all over the world. We spent the morning running the lower section of the Rioni river before we headed to our new camp a 4 hour drive away on the Mtkvari river in the town of Borjomi. By the end of day 6 both myself & Gaspar agreed that some of the students were in the position to be assessed for trip leader awards. After a brief introduction to the assessment criteria we started to set some simple trip leader scenarios. The first 3 scenarios all went quite smooth. We wanted to see how the students operated under stress and they coped really well. Day 7 saw usmove camp to the popular Agaravi river we decided to start driving at 5am this would ten give us a full day on the river. We all ran a famil trip which let myself & Gaspar see the river for the first time. The river was set in a stunning valley surrounded by forest & Mountains. After another amazing Georgian lunch we headed back to the river to look at tethered raft rescues as the Agarvi was the perfect place to practice. Day 8 was going to be a long day of trip leader scenarios with 5 scenarios in total to work through. The group were now in full swing even though they were tired. Gaspar had brought one of his rescue dummies for us to use we called her Nikita. Nikita quickly became a well liked new addition to the group. Day 8 came to a close after a long day on the river all of the students were tired but happy we decided that the last day of the workshop would be used for paperwork & Debriefs. The workshop was a success to the point where we are already planing another workshop in Georgia for Mid September. A big thank you to Natia & the team at USaid for sponsoring the event. Congratulations to all involved. Time to stop putting the word crazy in-front of the word Russian ! One thing I have observed over the years is that all great white water stories normally start with the sentence. "This crazy Russian paddler " Or "Crazy Russian inner-tube rafts. I sat back and giggled to myself as my short flight from Helsinki touched down at St Petersburg Pulkovo airport in Russia . I was about to find out first hand if this was true or not. My Mission this week was to observe and assist in the running of the first IRF workshop In Russia for over 15 years. For the past few seasons I have been mentoring Russian kayaker Anton Sveshnikov along the pathway to become Russia,s first IRF Instructor. The first time I met Anton was a few years back on the Zanskar river in India where I was running a workshop at the time. One of the first things that struck me about Anton at the time was he was Russian and not crazy. Since then myself and Anton have crossed paths many times and I have learned that not all Russian rafters & kayakers are crazy. The workshop was been hosted by Kivineimi rafting. Sergi, Egor & Kostantin made us more than welcome in there awesome riverside camp. The Kivineimi rapids are situated 115 Km North of St Petersburg. The 300m long section acts as the drainage between 2 lakes & creates a short but intense big volume 800 cumec class 3 run with easy logistics. The rapid ends in a lake which created some very interesting (raft eating) whirlpools to keep us on our toes. ( Imagine 800 cumecs hitting stationary water ). Antons job was originally run the safety kayak section of the workshop. in Order to avoid any language barriers I was more than happy to let Anto lead the way with the entire workshop. Day 1 kicked off with Introductions & personal kit inspections. I could see the students had many questions that needed answering. My Job was to let the students warm to me so that they felt easy asking what they thought were stupid questions (which they were not!). Most if not all of the students were attending a structured course for the first time and having somebody observing them and giving them feedback on their Performance was welcomed. Before we headed to the water we decided to take a look at the pre trip safety demonstrations we split into 2 groups 4 guides with me & 4 guides with Anton. A quick debate on how a foreigner who does not speak or understand Russian was going to asses their Russian safety talks soon followed. Through Anton I explained that a good safety talk needs no language barriers Actions speak louder than words. The Guides took a second to think about it as a result we got some amazing safety demonstrations opposed to traditional boring long winded, useless safety talks. After a few warm up runs and a breif lesson in the understanding of Russian raft commands for my benefit we were starting to see some impressive raft guiding skills. As the Rapid was only 300 meters long the guides have to make the most of every ferry glide & eddy available to them. The rapid even had an eddy fed play hole which was great to observe surfing skills & crew management. Day 1 was completed with a personal swimming skills assessment. I was happy to give demonstrations as Anton coached the students through the key points. The Students had a real motivation to make the final eddy on the swim test. Any student who missed the final eddy was heading towards the dreaded whirlpools if the downstream back failed. The evening of day 1 ended with a foundation knots and anchors section in preparation for the rope work test on day 3. During the 2nd or 3rd run on the 2nd morning. I realized that these guys were not crazy they simply did not have the same access to training that most western companies have. These guys had really good on the water skills but some of there background knowledge & risk assessment skills needed topping up. The fact that they had taken the time to join the workshop showed the fact that there is a real thirst for knowledge & education in Russia. The guide team were really starting to bond together. Most Russians start there whitewater life as the crew in cat-raft. During the workshop I got to observe a father daughter team in training as we paddled on the rapids. I strongly recommend giving it a go if you get the chance. Paddling a cat-raft is a good way to develop your water reading skills. The Afternoon of day 2 was spent looking at throwbag skills including the IRF throwbag test. The rapid gave us a perfect test site. The swimmers were moving in really fast water which meant that not only did the throw have to be accurate but the belay needed to be spot on. The guides showed us some excellent throwbag skills & Technique. One of the key messages that was now becoming a mantra was practice, practice, practice. the guides were taking the course seriously. Knots were constantly been practiced well into the night. Day 3 or wobbly Wednesday as I like to call it stated with a mechanical advantage ropework test. After the first 2 days some of the guides were looking a little tired and wobbly on there feet. Myself & Anton had antcipated this and planned to stay on the land this morning. Anton had assured me that all Russian me understand mechanical advantage as it was drilled into them at school. He was not wrong the Standard IRF test was passed with ease. The remainder of the Morning was dedicated to the art of safety kayaking. We spent time running the the role of the safety kayaker on a commercial trip. We then gave the kayakers a multitude of tasks that involved controlling a guideless raft form there kayak & dealing with multiple types of swimmers. Each of the kayak students agreed that climbing from there kayak to the raft in the middle of a rapid was a challenging but fun exercise. The guides also masted giving the kayak safety talk in silence which was impressive to watch. We were now moving into the time where we could potentially start to identify potential trip leader candidates. As this was the first workshop in Russia for a long time most of the students were either company owners or very experienced guides. Out of the group we identified 6 potential class 3 or class 2 trip leaders. Most of the students explained to me that one of the major challenges for a Russian raft guide is to take control of a crowd of rowdy Russian rafters. All of the candidates has very strong leadership capabilities . The nature of the Kivineimi rapid meant that all of the trip leader scenarios were going to be dynamic scenarios normally based around a flip. We ran scenarios focusing on lost customers, panicked swimmers, multi raft flips etc. the final day was spent finishing off the trip leader scenarios which then moved into the Flip test. the lake proved to be the Ideal flip drill test. I lead the way with a demonstration then the guides followed with some impressive times in the sub 40 second range which is outstanding. One of the things that struck me was the amount of support and positive energy that was flowing around the group. By the time the Flip drills were over the group had bonded really well and you could see that some of them wanted to continue learning. 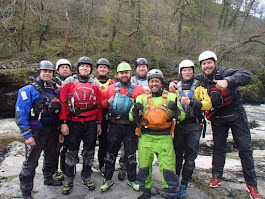 Which is exactly what happend as the IRF workshop flowed straight into a 3 day Rescue 3 whitewater rescue technician course. To sum the course up we had a blast. new friends were made. Russia has some new guides and its first IRF instructor. many thanks to Anton & the team from Kivineimi rafting for an amazing week of Russian hospitality. My company Lapin Koskikoulu is the world's northernmost provider of Rescue3 courses. 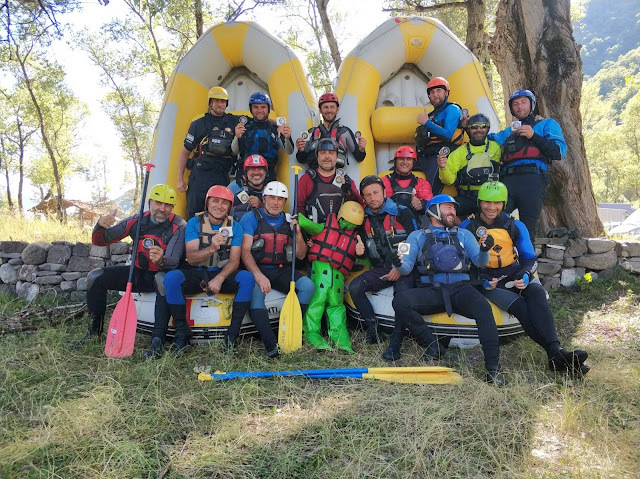 We also offer International Rafting Federation workshops both for raft guides and kayakers all around the world! Come and train with us! Check out our website for more info about the courses..